Sure, virtual assistant Alexa is very helpful on the Amazon Echo smart speakers. All you need to do is say "Alexa...," and complete your inquiry or task. But she also can be a migraine trigger. Ask Alexa to turn on or off a smart appliance and she will say "Okay" before completing the task. Ask her to play a song, and she repeats the title and the name of the artist before fetching the tune for you. If hearing her confirm your request is the straw that breaks the camel's back, we can tell you that the tool to silence Alexa is rolling out right now to the iOS version of the Alexa app. "Brief Mode," when enabled, replaces Alexa's verbal confirmation with a short sound. 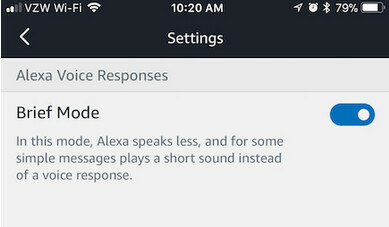 The toggle for Brief Mode can be found by going to settings > general > Alexa Voice Responses. The version of the app with this new feature is 2.2.202313.0. Some Echo users won't enable Brief Mode because they like hearing Alexa confirm their exact question or task before it is done. A simple tone obviously can't do that. There is no word at the moment about the Android version of the app, although there is no reason to expect that this new feature won't be made available for users of that platform. I have that version, but Alexa Voice Responses is not shown under General.